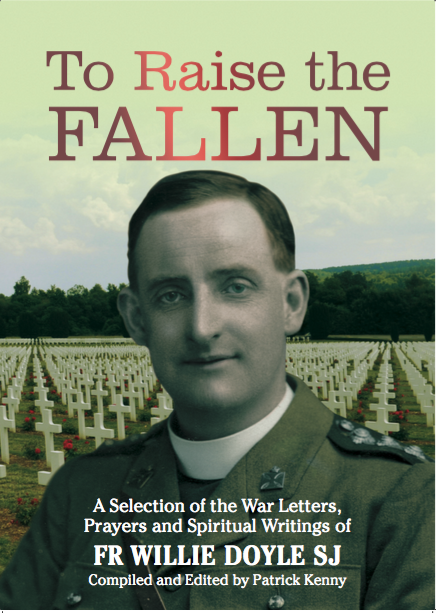 Today we continue with Fr Doyle’s narrative on the battle for Messines Ridge with the events that occurred on June 7 1917. It was a day of devastating losses for the German side. In fact, the explosions underneath the German trenches were the most powerful in history at that time. 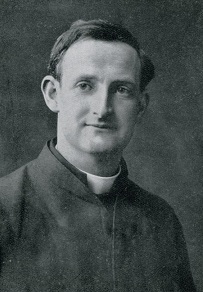 Fr Doyle did not glory in this loss of life. We see him today praying for the many thousands of Germans who were about to be killed, and we also see his touching care for Germans prisoners to whom he also ministered. 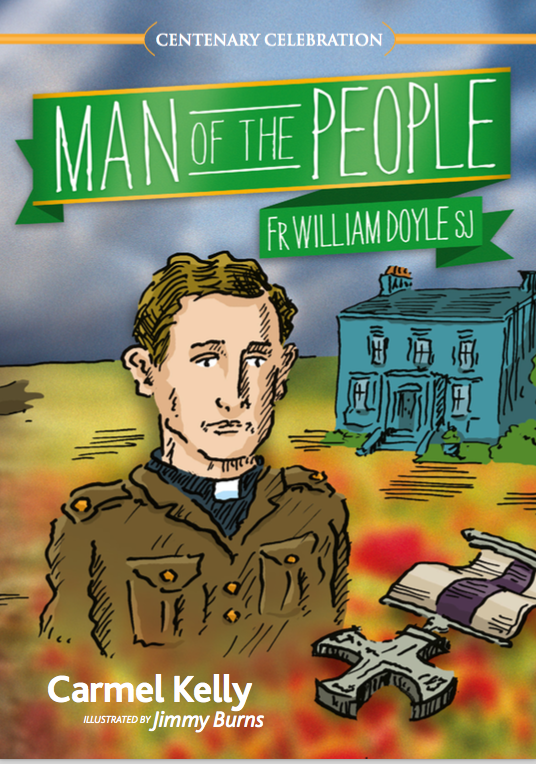 Fr Doyle loved all, and he did not distinguish between Catholic and Protestant, or between friend and enemy. He saw all people as children of God and deserving of respect. We also see his great faith in the Eucharist as he carried the host across the battlefield on that Corpus Christi day, searching for wounded soldiers in need of help. It wanted half an hour to zero time — the phrase used for the moment of attack. The guns had ceased firing, to give their crews a breathing space before the storm of battle broke; for a moment at least there was peace on earth and a calm which was almost more trying than the previous roar to us who knew what was coming. A prisoner told us that the enemy knew we were about to attack, but did not expect it for another couple of days. I pictured to myself our men, row upon row waiting in the darkness for the word to charge, and on the other side the Germans in their trenches and dug-outs, little thinking that seven huge mines were laid under their feet, needing only a spark to blow them into eternity. The tension of waiting was terrific, the strain almost unbearable. One felt inclined to scream out and send them warning. But all I could do was to stand on top of the trench and give them Absolution, trusting to God’s mercy to speed it so far. Even now I can scarcely think of the scene which followed without trembling with horror. Punctually to the second at 3.10 a.m. there was a deep muffled roar; the ground in front of where I stood rose up, as if some giant had wakened from his sleep and was bursting his way through the earth’s crust, and then I saw seven huge columns of smoke and flames shoot hundreds of feet into the air, while masses of clay and stones, tons in weight, were hurled about like pebbles. I never before realized what an earthquake was like, for not only did the ground quiver and shake, but actually rocked backwards and forwards, so that I kept on my feet with difficulty. Later on I examined one of the mine craters, an appalling sight, for I knew that many a brave man, torn and burnt by the explosion, lay buried there. If you expand very considerably the old Dalkey quarry near the railway and dig it twice as deep, you will have some idea of the size of one of our mine craters, twenty of which were blown along the front of our attack. Before the debris of the mines had begun to fall to earth, the ‘wild Irish’ were over the top of the trenches and on the enemy, though it seemed certain they must be killed to a man by the falling avalanche of clay. Even a stolid English Colonel standing near was moved to enthusiasm: ‘My God!’ he said, ‘what soldiers! They fear neither man nor devil!’ Why should they? They had made their peace with God. He had given them His own Sacred Body to eat that morning, and they were going out now to face death, as only Irish Catholic lads can do, confident of victory and cheered by the thought that the reward of Heaven was theirs. Nothing could stop such a rush, and so fast was the advance that the leading files actually ran into the barrage of our own guns, and had to retire. Meanwhile hell itself seemed to have been let loose. 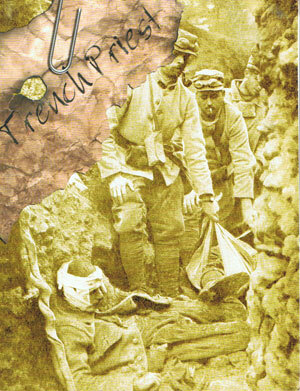 With the roar of the mines came the deafening crash of our guns, hundreds of them. This much I can say: never before, even in this war, have so many batteries especially of heavy pieces been concentrated on one objective, and how the Germans were able to put up the resistance they did was a marvel to everybody, for our shells fell like hail stones. In a few moments they took up the challenge, and soon things on our side became warm and lively. In a short time the wounded began to come in, and a number of German prisoners, many of them wounded, also. I must confess my heart goes out to these unfortunate soldiers, whose sufferings have been terrific. I can’t share the general sentiment that ‘they deserve what they get and one better.’ For after all are they not children of the same loving Saviour Who said: ‘Whatever you do to one of these My least ones you do it to Me.’ I try to show them any little kindness I can, getting them a drink, taking off the boots from smashed and bleeding feet, or helping to dress their wounds, and more than once I have seen the eyes of these rough men fill with tears as I bent over them, or felt my hand squeezed in gratitude. My men did not go over in the first wave; they were held in reserve to move up as soon as the first objective was taken, hold the position and resist any counter attack. Most of them were waiting behind a thick sand-bag wall not far from the advanced dressing station where I was, which enabled me to keep an eye upon them. The shells were coming over thick and fast now, and at last, what I expected and feared happened. A big crump hit the wall fair and square, blew three men into the field 50 yards away, and buried five others who were in a small dug-out. For a moment I hesitated, for the horrible sight fairly knocked the ‘starch’ out of me and a couple more crumps did not help to restore my courage. I climbed over the trench and ran across the open, as abject a coward as ever walked on two legs, till I reached the three dying men, and then the ‘perfect trust’ came back to me and I felt no fear. A few seconds sufficed to absolve and anoint my poor boys, and I jumped to my feet, only to go down on my face faster than I got up, as an express train from Berlin roared by. The five buried men were calling for help, but the others standing around seemed paralysed with fear, all save one sergeant, whose language was worthy of the occasion and rose to a noble height of sublimity. He was working like a Trojan, tearing the sand-bags aside, and welcomed my help with a mingled blessing and curse. The others joined in with pick and shovel, digging and pulling, till the sweat streamed from our faces, and the blood from our hands, but we got three of the buried men out alive, the other two had been killed by the explosion. Once again I had evidence of the immense confidence our men have in the priest. It was quite evident they were rapidly becoming demoralized, as the best of troops will who have to remain inactive under heavy shell fire. Little groups were running from place to place for greater shelter, and the officers seemed to have lost control. I walked along the line of men, crouching behind the sand-bag wall, and was amused to see the ripple of smiles light up the terrified lads’ faces, (so many are mere boys) as I went by. By the time I got back again the men were laughing and chatting as if all danger was miles away, for quite unintentionally, I had given them courage by walking along without my gas mask or steel helmet, both of which I had forgotten in my hurry. When the regiment moved forward, the Doctor and I went with it. By this time the ‘impregnable’ ridge was in our hands and the enemy retreating down the far side. I spent the rest of that memorable day wandering over the battle field looking for the wounded, and had the happiness of helping many a poor chap, for shells were flying about on all sides. As I knew there was no chance of saying Mass next morning, I had taken the precaution of bringing several Consecrated Particles with me, so that I should not be deprived of Holy Communion. It was the Feast of Corpus Christi and I thought of the many processions of the Blessed Sacrament which were being held at that moment all over the world. Surely there never was a stranger one than mine that day, as I carried the God of Consolation in my unworthy arms over the blood-stained battle field. There was no music to welcome His coming save the scream of a passing shell; the flowers that strewed His path were the broken, bleeding bodies of those for whom He had once died; and the only Altar of Repose He could find was the heart of one who was working for Him alone, striving in a feeble way to make Him some return for all His love and goodness. I shall make no attempt to describe the battlefield. 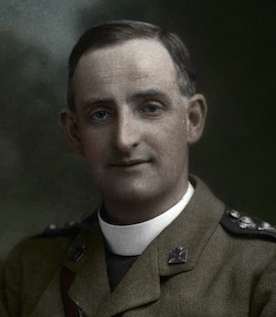 Thank God, our casualties were extraordinarily light, but there was not a yard of ground on which a shell had not pitched, which made getting about very laborious, sliding down one crater and climbing up the next, and also increased the difficulty of finding the wounded. The things I remember best of that day of twenty-four hours’ work are: the sweltering heat, a devouring thirst which comes from the excitement of battle, physical weakness from want of food, and a weariness and footsoreness which I trust will pay a little at least of St. Peter’s heavy score against me. 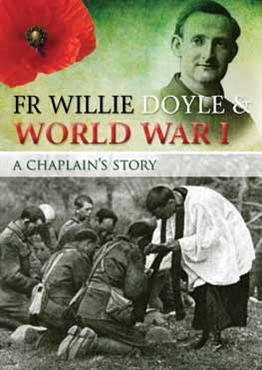 COMMENT: I hesitate to make any further comments on Fr Doyle’s extraordinary and detailed description of these events which occurred 100 years ago today. However, some further context may be helpful. This particular assault was a significant moment in the war. The explosions were, at that point, the most powerful in history, and they could be heard in London and even in Ireland. 1 million pounds of explosives were used – the mines took 18 months to dig and prepare. A movie called “Beneath Hill 60” has even been made about the preparation of one of the mines by Australian soldiers. The short video below gives some indication of what happened that day. The quality is not perfect – whoever uploaded it to YouTube simply recorded their TV with a video camera – but it features interviews with veterans and it is worth watching. 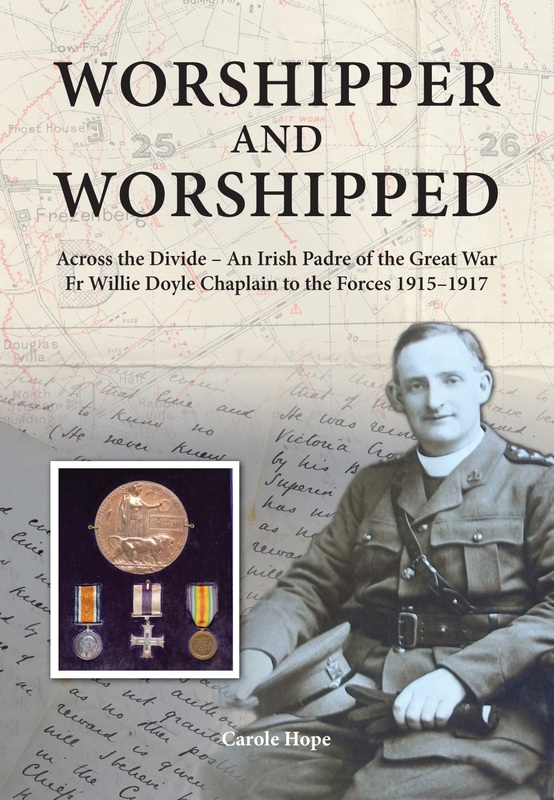 Carole Hope,the author of the superb biography of Fr Doyle entitled Worshipper and Worshipped (review here) has written the following historical background note about this battle. Fr. Doyle’s 8th Battalion Royal Dublin Fusiliers were one of the four battalions forming 48th Infantry Brigade. That brigade did not attack in the first wave, but were held in reserve in case of counter-attack, then to push forward and consolidate. Each brigade, including those in reserve, had four clear objective lines, which were colour coded on their maps as red, blue, green and black. However, there was also a final, “final” objective, the mauve line, to which, if possible, they should push out strong outposts to assist the fresh brigade coming from behind. The part of the Mauve Line which formed 8th Dubs’ objective was Sonen Farm to Leg Copse, east of Wytschaete village. The 8th Dubs had to wait until 11.30 a.m. that morning of 7th June 1917, over eight hours after the mines exploded, before orders were received from 48th Brigade HQ to advance. At 11.55am under the scorching Mid-day sun and heat of battle, the 8th Dubs moved forward. Captain G.E. Cowley advanced on the left with his ‘B’ Company; ‘C’ Company were on the right under 2nd/Lt B.W. Hughes, whilst‘A’ Company were at centre under 2nd /Lt F.M. Kiernan (less two platoons allotted to the Trench Mortar and Machine Gun sections, for carrying ammunition.) In reserve were ‘D’ Company commanded by Captain C.F. Healy. Good progress was made despite heavy shelling from 4.2’s and 5.9’s and casualties were slight. At 2pm ‘A’ Company reached its objective on the mauve line and established a post in front. Several prisoners were captured in dug-outs, four77mm field guns and two machine guns taken. Ten minutes later ‘B’ and ‘C’ Companies also reached the objective and started consolidating. At 6pm the 33rd Infantry Brigade followed up and passed through on to their position.